I cannot believe that the first week of November is behind us and that this is Beauty Professor's 900th post. Thankfully, this month has brought welcome relief from what has felt like an interminable heatwave. 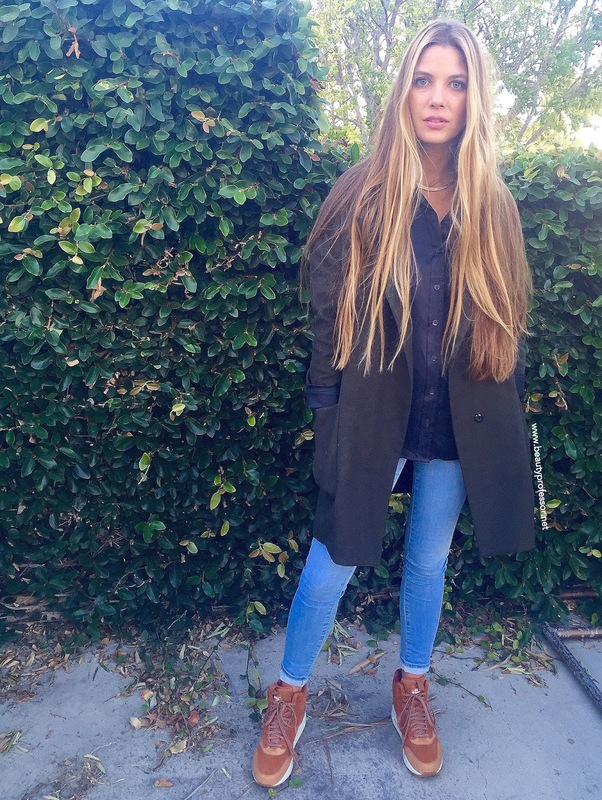 The leaves are changing and the temperatures are dropping, allowing for long sleeves, jeans and, dare I say it, COATS! This combination is generally my uniform of choice for packed teaching days and casual weekends; and although I often wear heels with this ensemble, I've lately been exercising a fond appreciation for the comfort of high-tops, especially towards the end of the week when my feet have had their fair share of strain. Consequently, here is an overview of my current November uniform, replete with a beauty breakdown of epic proportions. Above: This pair of Nike Air Max boots are absurdly comfortable and waterproof. Equipment France Slim Signature Blouse: I wear delegates from my Equipment collection a few times a week; they're unequivocally versatile and this black silk version is worth its weight in gold in my wardrobe. 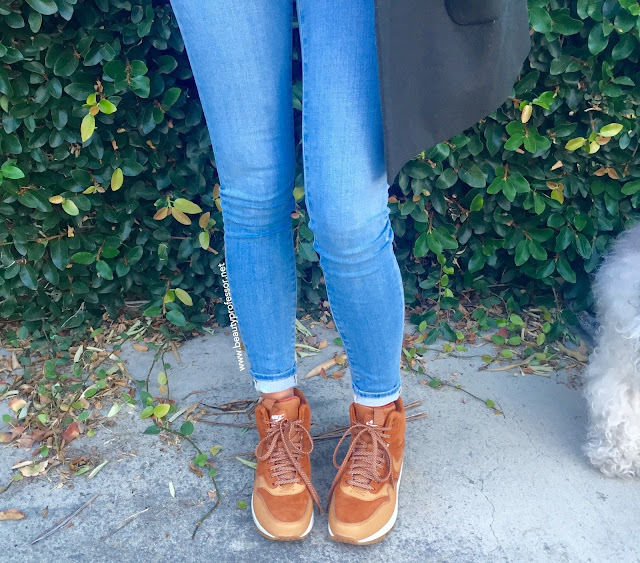 Frame Le Skinny de Jeanne in Barbour Wash: Procured while in Miami last month, these skinny jeans are a classic gem (finding a pair of bleached blue denim without holes is next to impossible) and the stretch is so comfortable and does not lose shape over the course of wear. Nike Air Max Waterproof Sneaker Boot in Tawny (also available at Footlocker): I have been on a hightop kick as of late and this sienna pair caught my eye. They have an elevated sole and feel as if you're walking on air...brilliant! Topshop Duster Coat (from two seasons ago...similar one HERE): Thin (yet warm) with a boyfriend fit, this coat is my homage to Elaine Benes on Seinfeld. Although I've had this particular garment for well over two years, I keep purchasing coats that look like this due to their ease of wear and timeless styling. The images of this makeup look were taken following an 8-hour teaching day with no touchups whatsoever...stalwart, indeed. Above: Beauty...sunlit + on heavy rotation. Kevyn Aucoin The Gossamer Loose Powder in Diaphanous Radiant (also available at Neiman Marcus and Barney's NY): This weightless loose powder sets makeup and maintains a matte finish while blurring pores and fine lines and imparting a slightly luminous glow. I would compare it most closely to the Surratt Beauty Diaphane Powder, though this version is tinted a yellow beige that actually yields a bit of color to brighten and warm up the face, thereby mitigating redundancy in my collection. Visart Sultry Muse Eeyshadow Palette (reviewed HERE and HERE and also available at Beautylish and Frends Beauty) applied along the lid with the Jenny Patinkin Gem Collection Eye Shadow Multi Brush and along the lower lashline with the Pencil Liner for a precise yet diffused finish. Tom Ford Lip Color in Lilac Nymph (reviewed HERE) mixed with Surratt Beauty Lipslique in Fee Soie (reviewed HERE) for a shiny, baby pink finish. SK-II Mid-Day Essence (also available at Sephora and Neiman Marcus and reviewed HERE) to set everything. Above: The Jenny Patinkin Gem Collection...the versatile gem-emblazoned quartet meets all of one's brush needs in a single velvet pouch...full review forthcoming. Above: Swatches of complexion product in natural sunlight. Above: The Kevyn Aucoin The Gossamer Loose Powder comes in a sleek, multi-tiered compact. Above: The powder comes with a puff that rests on a separate tray for on the go application. 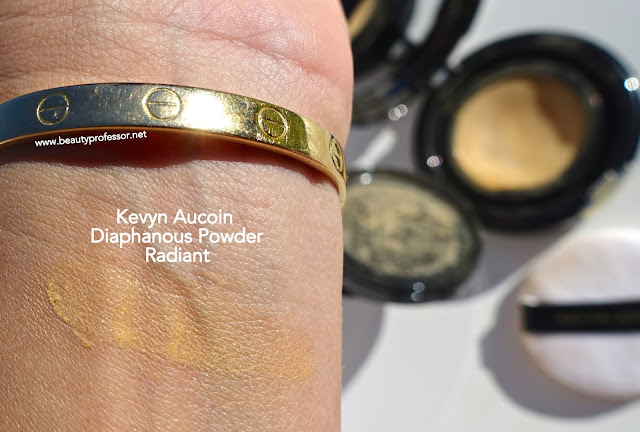 Above: A heavy swatch of the Kevyn Aucoin Diaphanous Radiant Powder in direct sunlight. This shade is tinted a yellow beige and will work with light-medium to medium-dark skin tones. Above: A close up of the minimalist gem on each of the new Jenny Patinkin brushes. Above: Eye products, including the invaluable Viseart Sultry Muse Palette. Above: I use the La Prairie Light Fantastic in my undereye region to banish dark circles while brightening and illuminating. Above: Tom Ford Extreme Mascara in Raven...I've been grabbing for this daily. Above: Swatches of eye products in direct sunlight. Above: I love combining Tom Ford Lilac Nymph with Surratt Beauty Lipslique Fee Soie for an opaque, cool-toned lip that lasts all day. Above: The products in action. Bottom Line: I hope you enjoyed this style + beauty hybrid post and would love to know what you've been defaulting to in this new month...do share! Also, the Sephora VIB Rouge Holiday Sale (product suggestions galore HERE) is in its final stages, running through 11/9 and yielding 20% off with the code ROUGE20...if you are not a Rouge but still have VIB status, your sale window is 11/13-11/16; simply use the code VIB20 for your 20% savings. Good things ahead, including a host of new product procurements, a skincare update and a new video! ** PR samples provided for review denoted by an asterisk (the rest purchased by me), however, as always, all of my opinions are expressly and unequivocally my own. © 2012-15 Beautyprofessor® All Rights Reserved. Do not copy, reprint or republish content and/or photos without author's written permission. Wow! The Kevyn Aucoin Diaphanous Radiant Powder looks so finely milled!. You've found me a more refined & convenient alternative to the Ben Nye Banana Powder! Also, bravo on looking relaxed yet immaculate after an 8 hr teaching day! Isn't it so fine and light...truly, a convenient and gorgeous option! Hi BP, thank you for another great post. How does it compare to Charlotte Tillbury Airbrush Flawless Finish in number 2 medium ? I have yellow undertones and now using Tom Ford perfecting foundation in Natural . With regards to your question, the foundation is similar in tone to the TF Natural (if only a hair lighter in depth). It is absolutely wonderful in terms of coverage and lasting power! So true about finding skinnies without holes. Even my favorite current pair has a manufactured rip, and I wish it didn't! Will have to check out Frame denim. Indeed...hope you find some Frame you love, Robyn!